What’s Wrong with World Youth Day? by Cornelia R. Ferreira and John Vennari, Canisius Books, 2005, 229 pp. It sounds so good and wholesome – youth coming together to greet the Pope, celebrate their Catholic Faith and learn more about it to evangelize others. What could possibly be wrong with the World Youth Day launched by John Paul II in 1985 in Rome, and repeated 18 more times in cities around the world? 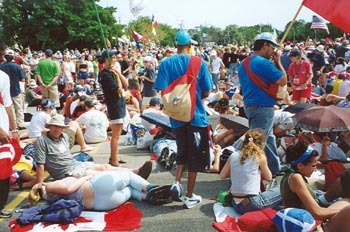 In 1993, the US hosted a WYD in Denver. In July 2002, Canada took its turn in Toronto. I have often spoken to parents with “misgivings” about WYD. But surely, they rationalize, it must be all right because the Pope will be there, the Bishops support it, and the parish priest or CCD director is driving the van of young men and women to the event. The alarm should be going off with that last phrase: It was always against Catholic morals for youth of mixed sexes to travel together like one big family for camping trips or overnight retreats. These strange new practices disregard the reality of original sin; they follow a loose new morality of a post-Vatican II Church. To expose the doctrine of this novel Counterchurch and how it has shaped an egalitarian and pan-religious World Youth Day, Corneila Ferreira and John Vennari joined forces on different fronts with an on- and behind-the-scenes account of what is going on at WYD. CFN editor Vennari gives the on-the-scene story. In July 2002, he decided to attend the Canadian WYD to provide an eyewitness account of what goes on. He stayed with the family of the well-respected author and speaker Corneila Ferreira who was doing extensive research on how the event was part of a restructured Vatican II Church. The two authors decided to combine their efforts. 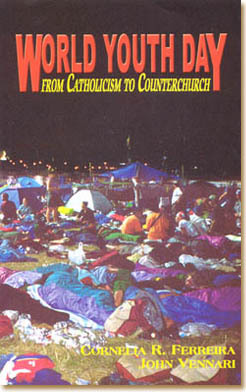 It was a fruitful union that has given us their newly released book, World Youth Day, From Catholicism to Counterchurch. Now, parents with healthful doubts about WYD have a secure resource to learn about both what goes on at a WYD, and the bad thinking and changed doctrine that fuel it. But note carefully, we are no longer talking about a normal Catholic parish life, but rather an expanded community including followers of other creeds, and even those who profess no creed. The idea is to set aside doctrine so that all can come together to dialogue, or “do a good” for others. It is the grand universal brotherhood, the unity without borders, to which John Paul II often referred to in his addresses to youth (p.118). WYD propaganda also constantly speaks of pilgrimage: Youth as pilgrims, youth on pilgrimage. But again, the word has changed. Pilgrimage no longer means a journey to a sacred place. It has become an evolutionary journey of “self discovery,” of finding one’s own spirituality. The WYD sessions encourage youth to challenge authority and “the old ways” and work together to create new solutions to religious questions in tune with the times. Join together to find the values that define your spirit, the youth are told, and then act them out. What is the spirit of WYD? Mrs. Ferreira describes it as adolescent and artificial (Chapters 3 and 4). The name itself is sham: the so-called “youth” include a good portion of adults up to age 35. The event is not a “Day,” but extends to a week of scheduled “experiences” that revolve around pop and rock concerts, a grand party. The celebration is hocus. The youth celebrate themselves: “We are the Youth, the future of the world!” “We are the light of the world and salt of the earth.” The aim of evangelization is a charade: instead of bringing others to the truth of the Catholic faith, the youth hug and “exchange experiences” with persons of all religions and creed. Facilitators of the event are not even required to be Catholic. The aim of unity is also a charade since it is based on a false premise that all religions lead to salvation, that all gods of false creeds can be adored alongside one true God. In Canada, for example, Catholics attended pagan Indian ceremonial rites to the “great spirit” which were referred to as “traditional prayer services” (p. 90). Another item considered irrelevant at WYD is the moral code of times past. Mrs. Ferreira notes: “At Rome, dubbed a ‘Catholic Woodstock,’ bare shoulders and midriffs and micro-minis were allowed in St. Peter’s, and the papal Mass featured dancing girls in wispy costumes.” In Toronto, pilgrims “stripped down to bikini tops and frolicked in a fountain at a main venue” (p. 64). 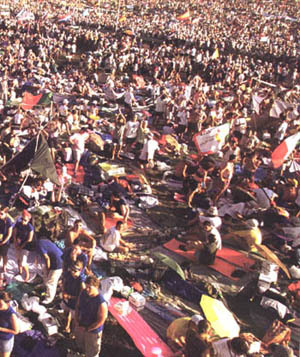 On the night before the papal Mass, the youth - male and female together - were camped out in tents or sleeping bags for what the secular press has dubbed as the “Papal slumber party” (p. 65). What happened in some of those tents can be left to the imagination of the reader. Certainly, it was to avoid this kind of scandal that Catholic morals always – until Vatican II – forbade non-married men and women to sleep in such conditions. In two enlightening chapters, Mrs. Ferreira examines the origins of WYD. I was always taught if you want to understand the intent of a movement, find its roots. In Chapter Five, she shows the roots of WYD: the not-so-transparent progressivist groups that have appeared in the Church after Vatican II to build a new Church based on community. These are lay movements like Focolare, Communion and Liberation, the Neocatechumenal Way. The methods employed at WYD follow the Focolare “formula”: bands, dances, personal testimonies, loud cheering. The delirious emotion exhibited toward the Pope parallels the “manipulated mass hysteria” surrounding the movement’s founder Chiara Lubich. The egalitarian and ecumenical principles that orient these groups in the building of a new future church are the same that direct the WYD agenda. In fact, these movements provide a large part of the directors and work crew for the WYD events. And like WYD, Lubich’s revolutionary “spirituality of unity” “enjoyed the unreserved blessing of John Paul II. Chapter Six, “Teilhard and the Sillon Triumph,” digs deeper still. “The Church’s pilgrimage to the Counterchurch started at Vatican II,” notes Mrs. Ferreira, “utilizing the combined forces of Masonry, Communism, Humanism and Modernism.” She shows how each of these enemies burst forth at the Council to become official policy and begin to reshape the face of the Church. In particular, she points to Teilhard de Chardin as one of the masterminds of the new religion based on personal experience, humanist goals, and an illuminist dream. Chardin’s thinking had a strong influence on modernist theologian Karl Rahner, one of the first to spread the concept of “Church as the people of God,” which he incorporated in his writing of Lumen Gentium. Rahner sustained that the faithful people themselves were the source of authority in the Church, and thus the source of prophetism. Permit me to add a side note here: Karl Rahner was the mentor of another up-and-coming progressivist theologian at the Council, Father Joseph Ratzinger. To date, the disciple has never renounced or condemned the revolutionary thinking of his master. One can only wonder if, as Benedict XVI, Ratzinger will denounce this bad doctrine? Also, will he correct the rampant offenses against the Catholic Faith that typify World Youth Day? So far, Pope Benedict XVI has affirmed that he would be present at the next WYD in Cologne, Germany, which promises to follow the previous pattern of an event fostering tolerance for false religions, bad morals and vulgarity. Will a word from Pope Ratzinger come and change the direction of the event? So far, at least, nothing has been said. Above, youth show scant interest during the papal address. 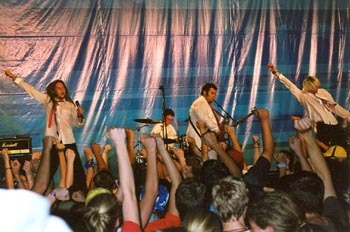 Below, the punk band dAYZ wAGE performed a riotous rock concert to a packed hall. In Part Two, John Vennari takes us to the Toronto WYD. From the Friday punk rock concert (Chapter 10) to the Stations of the Cross and the “not-very-solemn” Vespers (Chapter 12), to the Papal Mass loaded with liturgical abuses (Chapter 15), we follow his weary steps and often incredulous observations of what he finally terms “the world youth day sleepover” where youth “cross the threshold of heathenism”( Chapter 14). One might be tempted to think Vennari is exaggerating his description for effect, but that is not the case. He is careful to point out pious groups here and there, noting obvious well-meaning youth chanting Catholic hymns; o a solemn moment in the services. What he reports is the same story I have heard from other attendants. The dominant tone is that of a rock ‘n’ roll festival, and the general intent of the youth present is to meet others and have fun. “World Youth Day delivers a counterfeit, emotional pep-rally religion. Its ceremonies contain countless novelties, practices and sacrileges that have been condemned by the constant teaching and practice of the Popes throughout the centuries. WYD is a scandal to our young people. It corrupts the youth.” (p. 214-5). By the end of 1st century, the Roman Empire was in a stage of decadence and corruption. The once proud Senate and upright Roman citizen had been weakened by a succession of corrupt and decadent Emperors and a general relaxation of customs. The people were distracted from the problems of the collapsing Empire by bread and circuses, cheap food and free entertainment: the chariot races of the Circus Maximus and violent gladiatorial contests and the slaughtering of Catholic martyrs in the Coliseum. Roman Senator Juvenal lamented the reduced state of people, who no longer sought honors, battle, high ideals and sober orations, but rather clamored “for just two things – bread and circuses.” Panem et circenses. The expression bread and circuses had come to refer to benefits or entertainments intended to placate or distract attention from a serious situation. I think it applies quite fittingly to the popular WYD. Bread and circuses for the youth – to distract them from a seriousness of Catholicism by offering pop entertainment and a religion of fun and games, a spirituality to suit their fancies. A question comes to mind: Who is more to blame, the ecclesiastical authorities who sponsor and promote these WYD circuses, or the masses of youth who attend them? “ My primary frustration is not with the youth, many of whom I believe are well-meaning but … defrauded. 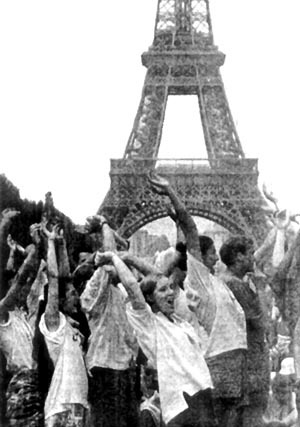 My primary frustration is with the adults who promote, organize, take part in, and praise World Youth Day as though it were a legitimate means to transmit Catholicism.” (p. 162). In his last chapter, Vennari sets out quite clearly the correct path for the serious Catholic who loves God and Holy Church, the Catholic who would follow the perennial Magisterium rather than embrace novelties, abuses, and heresies. He provides solid evidence from the teaching of the past Popes, Saints and Doctors of the Church that a Catholic has the right to maintain the purity of the Faith and doctrine and practice. Further, a Catholic has the duty to resist erroneous teaching and novelties, even if such teaching or novelties issue from a Pope. In the case of World Youth Day, the application of this teaching is very simple. If you know the kind of activities that go on there, if you know the false thinking and doctrine that stimulates its spirit – which you will, if you read this work – then the WYD should be strongly and unequivocally rejected.